James Hyde, district conservationist and GLCI Coordinator for CT, USDA-NRCS spoke about grazing technical assistance issues in Connecticut. He started out with the recent history of grazing in CT. Until the 1980s, there were State & Federal resources traditionally available for technical assistance. In the 1990s, there was a dramatic loss of technical resources as competing state and federal programs reduced in real dollars the money for conservation and grazing programs. As state and federal employees retired or relocated, some of these positions were not back-filled. In the 2000s, the status quo of the 1990s prevailed, CT graziers had limited access to grazing information or sought outside resources. In the 2010s, farmer groups and private equity are trying to organize to develop a physical infrastructure. They are also working to establish source for information (grazing library). Current state of grazing in CT has some potential as there is a strong demand for local foods, a strong market for grass-fed animals, and an increase in new farmers with the resultant increase in small herds and mixed species grazing. Joe Horner, Dairy Grazing Services, Dairy Farmers of America, Columbia, MO was the next speaker. Joe represented a consulting firm that works with grazing-based dairies on a fee basis to improve their grazing and pasture management. Dairy Grazing Services (DGS) just recently started in 2010. DGS objectives are to provide fee based on-farm consulting, offer grazing products, and build a stronger U.S. dairy grazing culture. The grazing wedge is a key concept that they use to guide farmers in how to move cows through a series of pasture paddocks so that forage is utilized at its best forage quality for either pasture or as stored feed if grass growth is faster than the cows can be moved through the entire pasture system. Paddocks with more mature forage that have measured forage mass above a target forage mass (2500 pounds per acre, for instance) considered to be too mature for grazing is cut for hay. 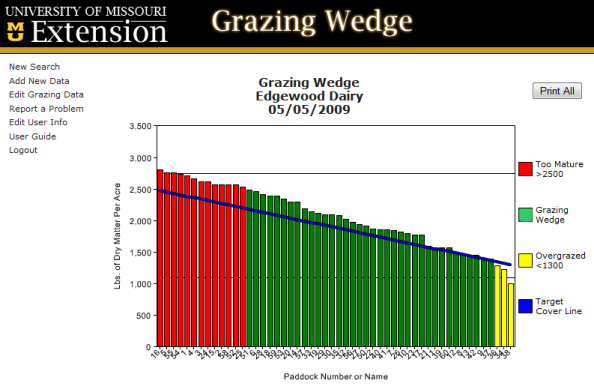 Paddocks with measured forage mass that is above the declining (blue) line of the forage wedge on a graph depicting forage availability in each paddock (see below), but at or just below the target forage mass are the paddocks to be grazed next, starting with the first paddock that has just achieved the target forage mass. Blue cover line in the illustration below projects from the Y-axis on the left at 2500 lbs. of DM per acre to 1300 lbs. per acre on the right. Note that this is for May 5th. Later in the season, this line may need to be adjusted depending on achievable forage mass if weather turns dry and hot. This requires measuring forage mass, usually with a rising plate meter, but the effort is rewarded by staying to top of the rotation as forage growth rate changes throughout the pasture season. It avoids crashes in pasture forage availability, having way too much or too little, with no plan on what to do next. They have two on-farm consultants, Mike Lamborn with experience in VA and TX and Tony Coltman with experience in MO. Both have worked in the New Zealand dairy industry. Their grazing products are Gallagher fencing products and Jennquip rising plate meters. DGS wants to network with existing grazing groups and service providers, promote recognition that grazing is a serious alternative dairy business model, and bring best grazing principles and practices to producers currently under-served by other providers to strengthen the dairy grazing industry in the US. Rob DeClue wrapped up the session of speakers. GLCI-NY began in 1997. Currently, there are two NRCS grazing lands specialists, one conservation district grazing specialist, 3 RC&D grazing specialists, and 1 Adirondack North Country grazing specialist. Emphasis is on ensuring Prescribed Grazing conservation practice is installed and operated as intended. Some tools that were developed to help farmers manage their pastures was the pasture estimation device, Prescribed Grazing Management (PGM) planning worksheets, and a flood fence prototype used to span streams where needed in pastures. There were also some good how-to booklets put together. Graze-NY is a congressional earmark supported by both major political parties over the years in central NY. It began in 1996. Thirteen counties are in Graze-NY now with 13 field staff assisting in the effort. Emphasis is on getting PGM plans written and the installation of the conservation and grazing management practices called for in those plans and getting them recorded in the NRCS reporting system. The Upper Susquehanna Coalition is another source of grazing technical assistance. They provide 2 grazing coordinators, one of whom is Troy Bishopp, a member of the Northeast Pasture Consortium. The NRCS has a GLCI contribution agreement primarily with local Soil and Water Conservation Districts. This is how Rob’s position is funded with the Chenango County SWCD. Sustainable Agriculture Research and Extension (SARE) grants have been used to support grazing. New York State Non-Point Source Abatement and and Control Program is another source of money for grazing application. A group of farmers are given highest priority for funding. The drawback is that it takes up to 2 years to get the go-ahead to do a project. All the grazing application and planning work is done by governmental employees. There are no private technical service provides (TSPs) registered in NY. Challenges to keeping a good grazing program going is turnover of staff, sometimes lack of experience in grazing systems, and farmers going after funding dollars for grazing but not really committed to do the management once practices are installed. Consistency of the technical assistance provided is not always there. Clientele is diverse based on background, age, means, and livestock type. Follow-up is essential to ensure proper management is occurring. It also disconcerting that the benefits of best management practices (BMPs) on pastures are undervalued in Chesapeake Bay loading models. This works against pasture BMPs in the race for cost share dollars.